Strider balance bikes are simple bikes that are designed to teach kids to move and balance on two wheels. They have foot propulsion to help the kids learn the basics of riding. When the child masters the art of balancing and steering it can easily move to a bicycle with pedals or a motorcycle. The child can use a strider balance bike when the child is just 18 months old and can get the hang of steering and balancing. A balance bike will help your child to develop coordination, balance and confidence. There is wide variety of striker balance bikes available which have graphics to match the popular brands of motorcycles. Are you looking for balance bikes for your kids? There are plenty of balance bikes available in different brands. They are made of metal and wood and are perfect for toddlers. The prices of these bikes are very reasonable. Each bike comes with unique benefits to help your child to learn to balance and steer. It is the best bike for children to begin their basic skills of balancing and steering. It is also known as a gliding bike or a sliding bike. With a balance bike your child can learn to ride fast safely. These bikes can be ordered online and are shipped anywhere in Canada. They accept your orders 24 hours a day and seven days in the week. 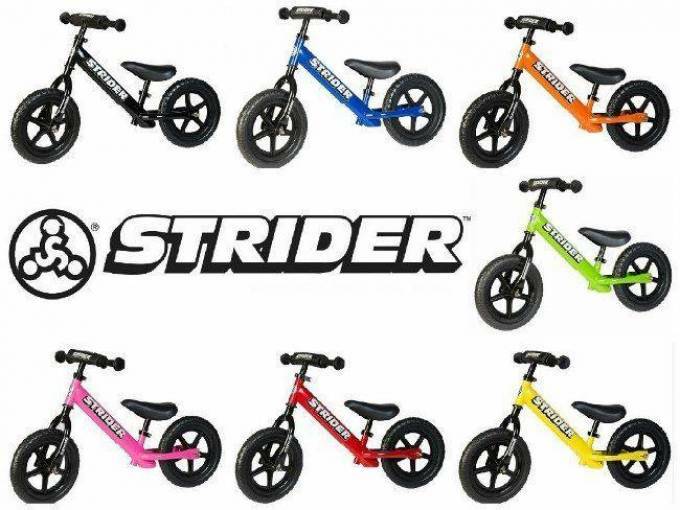 Are you deciding to get strider pre-bike for your child? They are available in different colors and your child will be able to learn to steer and balance within a short time. You can book it online in any color that you like. It is very light and hardly weighs 6.4 pounds. It has a metal frame with a quick-clamp to adjust the seat to any height between 11 -16”. There is a quick-clamp to raise and lower the handle bar to any height that you desire. There are no pedals but there is metal portion to rest your feet. It cost $115 and will be shipped to you within a week. The handle bar has nice small grips with extended portion with padding. The Tires are made of EVA polymer rubber. You do not have to pump air into the tires. If you want to give your child a bike for his birthday a balance bike is the best option. With a balance bike he cannot come to any harm but he will like it the moment he sees it. It comes with two seats a larger one and a smaller one. After he out grows the smaller seat you can change to the larger seat. The handle bar and the seat can be adjusted as per the requirement of the child. Once the kids learn to steer and balance on this bike, they can be give bike with pedals to ride. These bikes are known as running bikes or sliding bikesand the child can learn to ride with this bike as early as 18 months. So, get your child a balance bike and let him enjoy himself learning to balance. Tots 'n Tykes is an online store for kids Strider Balance Bikes in Calgary and Okotoks Alberta.